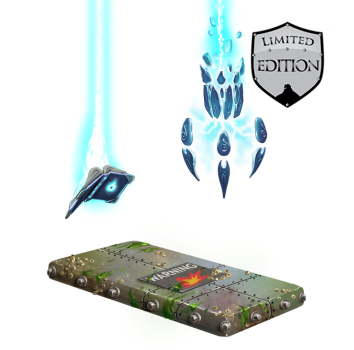 The Depth Charge Base is a Limited Edition base and can no longer be acquired by hunters. An old, antique depth charge found washed ashore and repurposed as a trap base. Perfectly safe while on land but activates as soon as you go below sea level. This base receives an additional 1,000 Power when diving at the Sunken City! The Depth Charge Base could only be bought from the Extreme Toboggan Challenge Trapsmith during Great Winter Hunt 2015. It cost 200,000 gold and could not be refunded. 15 December 2015: The Depth Charge Base was made available with the start of Great Winter Hunt 2015.